When you get to the end, you will see why the post is so long. A letter they were quoting had vanished from it's original internet source. In other words j4g is probably one of the few, if not the only, site still preserving a letter written to Mannerheim from Ribbentrop. Good work. He just needs to know that "reparations" (in context of war) isn't a payment by someone that has harmed you. It's a payment a loosing party has to pay after a war to winning parties. Another great article. Here is one from the OP in this thread courtsey of Mortimer. I feel this clip is relevant. It shows the honesty of revisionists who correctly support Suvorov's basic ideas that have only ended up being confirmed by others. Occasionally Suvorov contradicts himself. For example, he argues that when Hitler turned his troops southward to Kiev before Moscow was taken, he all but lost the war. But elsewhere Suvorov recognizes that in war the best strategy is to defeat the enemy’s armed forces, not to take prestige cities. In fact the German forces turned south not so much to take Kiev as to destroy another Soviet army. The German generals, who after all had some experience in the conduct of war, were of course perfectly aware of the pointlessness of capturing large cities merely for trophy value. When the enemy’s armed forces are destroyed, his cities will fall on their own. Only in the case of Stalingrad did the German invaders commit all their forces and energies to take a city – with disastrous results. The previous winter, after the failure to take Moscow, reason had prevailed and the Germans retreated to a more defensible line, where they were able to regroup and reinforce their armies. Without the help of the Finns, German forces were inadequate to take Leningrad, so they bypassed the city. But Hitler forbade any retreat from Stalingrad. Its capture had been aimed, among other things, at blocking oil shipments up the Volga north to the Soviets. The Wehrmacht was no less concerned to fuel its own war machine: it had secured the Crimea in order to protect its chief sources of petroleum, in Romania and Hungary, from Soviet air attack from that peninsula. Suvorov’s excessive regard for Stalin’s leadership and his equally overdone criticism of Hitler’s ignores the fact that Germany nearly did defeat the Red Army. Had the United States, Great Britain, France, and other allies not supported Stalin with arms, trucks, provisions, and other necessities of war, the outcome might have been quite different. It must also be recalled that, throughout much of the long Russian-German conflict, Germany was compelled to divert twenty to thirty percent of its war effort to the Western front. Suvorov’s main contention, that Stalin groomed Hitler to do his dirty work in Europe, is untenable. It gives far too much credit to the Soviet dictator. Germany never wanted a war in the west, let alone one against Britain. True, the Germans suspected France – especially under the government of Léon Blum’s popular front – of further mischief. It must be recalled that Germany’s ill-fated attack on the Soviet Union followed several successive attempts at its encirclement by its enemies. In the 1930s British and French diplomacy had succeeded in surrounding her with hostile nations. Then came the attempted Scandinavian and Balkan encirclement, and finally that of the U.S.,UK, and USSR. With both Soviet and Western forces increasing in strength, Germany took a desperate gamble to break the ring, rather than wait until the Red Army seized the most opportune time to pounce. True, the gamble failed. Today’s Germany, however, is a prosperous country, much smaller than it might have wished, but the remnant of Stalin’s USSR, stripped of the Tsar’s empire, is not much more than an overgrown economic basket case. Suvorov exaggerates Stalin’s “genius.” While it is true that he created a police state and built up the Red Army to superpower status, his armed forces failed miserably at the time they were most needed, June 1941. It is also true that Stalin dominated Churchill and Roosevelt, above all in the several conferences that determined postwar arrangements among the “Big Three,” but the Western leaders had cast themselves in the role of supplicants who needed the Red Army to contain and destroy Germany. For all that, Suvorov has made a great contribution to correcting the history of the Second World War by dispelling, once and for all, the myth of a peace-loving Soviet Union invented by Communist propagandists and circulated in the West by their dupes and sympathizers. This is a very good summary. Suvorov does, in my opinion, tend to exaggerate Stalin's prescience and strategic thinking abilities just a bit. Mulegino1 wrote: This is a very good summary. Suvorov does, in my opinion, tend to exaggerate Stalin's prescience and strategic thinking abilities just a bit. A review of the book Stalin's War by Ernst Topitsch - http://codoh.com/library/document/2205/ This author is of the opinion Barbarossa was preventive. I think that Hitler's peace offers are also relevant to the issue of whether the Nazis were really aggressive or rather defensive after being pushed into a corner. - An extract from The Forrestal Diaries, in which the US Secretary of State William Forrestal quotes British Prime Minister Neville Chamberlain as complaining that “the world Jews” have forced England into the war. Dr. Friedrich Stieve (1884—1966) was Germany’s foremost diplomatic historian of the first half of the twentieth century. He obtained his PhD in history at Heidelberg university, and during the First World War served as press attaché at the German Embassy Stockholm. From 1928 to 1932 he served as the German Ambassador in Riga, Latvia. And then from 1932 to 1939 served as the first head of the Cultural Policy Department of the Foreign Office. From 1933 to 1936 he was also Head of the Archives of the Political Archive of the Foreign Office. In February, this topic got noticed on Stormfront. Here, starting on page 2 of a page 4 topic, the anti German posters really get their knickers in a knot. It's hilarious. Nessie started a topic on rodoh called Hitler's Peace Treaties. Observe how he dodges the information I have brought over to rodoh from this thread. I just posted this in the rodoh thread. I may as well put it here too. The speech made by Stalin of August 19 1939, was obtained by the French Havas agency from Moscow by way of Geneva from an "absolutely reliable source." It was published as early as 1939 in volume 17 of the Revue Du Droit International. Remarkably, the authenticity of the speech is disputed with extraordinary zeal by Stalinist propagandists and their blind adherents right up to the present day. However, in an interview under the hypocritical headline "A Mendacious Report from the Havas Agency" in the official party newspaper Pravda on November 20, 1939, Staln himself denied the speech. The mere fact that Stalin felt personalyl and immediatly compelled to publish an official denial reveals the extent to which he felt he had tipped his hand. Only in extraordinary cases did Stalin ever allow himself to consent to his personal views. The historian Ms. T. S. Bushueva, during the course of a scholarly evaluation of Viktor Suvorov's books, which had been distributed in editions of millions of copies, found the text of the speech by Stalin. The speech, which had long been known, was discovered in the secret depths of the former Special Archives of the USSR, apparently prepared by a member of the Comintern. She made it available to the Russian public fo rthe first time in the periodical Novyi Mir in December 1994. This epoch making speech by Stalin is also contained in the published edition of the minutes of the ocnference of the "Memorial" society held on April 16, 1995, in Novosibirsk. It has been analyzed and commented upon in detail by the historians T. S. Bushueva and I. V. Pavlova, as well as by Professor V. L. Doroshenko. Russian historians today have long seen an immeditae connection between August 23, 1939, and June 22, 1941. The August 23, 1939, Non-Aggression Pact with Hitler enabled Stalin to achieve his initial goal. Marshal Zhukov of the Soviet Union, recalled that Stalin was "convinced that the Pact would enable him to wrap Hitler around his little finger." "We have tricked Hitler for the moment," was Stalin's opinion, according to Nikita Khrushchev. The August 23, 1939, Non-Aggression Pact encouraged Hitler to attack Poland and as a result - just as Stalin expected - a European war broke out. The Soviet Union participated as an aggressor, beginning on September 17, 1939, without, of course, incuring a declaration of war from the Western powers. The leader responsible for Soviet foreign policy, the Chariman of the Council of the People's Commissars, Molotov, spoke before the Supreme Soviet on October 31, 1939. He said: "A single blow against Poland, first by the Germans, and then by the Red Army, and nothing remained of this misbegotten child of the Versailles Treaty, which owed its existence to the repression of non-Polish nationalities." It was the express wish of Stalin that nothing should remain of the national existence of Poland. And now for the footnotes. 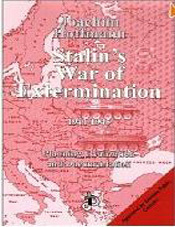 When on July 16, 1996, in the daily newspaper Die Welt, Carl Gustaf Strohm published a strikingly accurate report on the contents of the speech given by Stalin on August 19, 1939, the international apologists for Stalin immediatly considered themselves provoked. It was the task of one of their spokesmen, Gabriel Gorodetsky, to rescue the endangered Stalinist version in the new era. Gorodetsky is the Director of the Cummings-Institute for Russian history at the University of Tel Aviv, and was also one of the organizers of the conference held between January 31 and February 3, 1995, in Moscow. In the columns of Die Welt on August 31, 1939, Gorodetsky launched a counterattack in which he claimed that the speech by Stalin of August 19, 1939, was a falsification by the French secret service, but in so doing, he became immediatly mired in so many contradictions that his arguments were destroyed. For example, he referred to December 23, 1939, as the exact date of the French falsification, forgetting that Stalin published his official denial in Pravda on November 30, 1939, I.E. twenty three days before the text of the speech by Stalin would therefore have to have been known to the French secret service at a much earlier time. Another momentous blunde that entirely destroys Gorodetsky's credibility is that he claims that the secret additional protocol was only discussed for the first time at the end of September 1939 during Ribbentrop's second visit to Moscow. Whereas a fascimile of the full text of the "Sekretnyj Dopolnitel'nyj Protokol" (Secret Additional Protocol) on territorial annexation, signed by Molotov and Ribbentrop in Moscow on August 23, 1939, had even been printed by Werner Maser in Der Worthbruch, pp. 48f. Gorodetsky confuses the Secret Additional Protocol to the Non-Aggression Pact of August 23, 1939, with the Secret Additional Procotol to the Border and Friendship Treaty of September 28, 1939, which, for an expert, is rather astounding and his hardly excusable. The desperate situation of the Stalin apologists today and the methods to which they resrot in their confusion were also revealed by H. -E. Volkmann, who appeared in the weekly newspaper Die Zeit on June 3, 1997 as "Research Director of the Military History Research Office of the Bundeswher." In this capacity, he published a full-page article on the "Legend of the Preventive War" with an attack on the former Inspector General of the Bundeswher, General Heinz Trettner. In doing so, he merely demonstrated that he is not familiar with the very numerous German and Soviet source documents, or with the international research situation. His shabby argumentation is an attempt to show that Hitler planned aggression, which, of course, is no longer a problem in contemporary research. Academically, the real question relates to whether the war of conquest prepared by Stalin that Hitler preempted rather by accident. Volkmann's rather incompetant article raises the question of whether the article is an attempt to mislead on ideological grounds, or whether it is quite simply the result of ignorance. Volkmann, who trivializes the Lenin-Stalin system of despotism at every opportunity, is also mentioned by Rudiger Proske, Wider den Missbrauch der Geschichte, pp. 16, 34, 61 as well as Professor Dr. jur. Gerhard Eiselt "Die historisch-politische Auseindersetzung." "O Lzhivom soobschenie." The text of Stalin's official denial in Pravda of November 30, 1939, and a few other documents were made available to me by Dr. Michael Guterbock of Berlin, to whom sincere thanks are due at this point. Suworow, Der Tag M, pp.76f. Busuerca, "...Proklinaja - poprobujte ponjat...", pp. 232f. To the author, the contents of the verified speech by Stalin (which was, after all, known since 1939, published in the conferences volumes of Novosibirsk, and confirmed by the entire chain of historical events) was so minor a discovery that when the outworn text was sent to him by Dr. I. M. Pavlova in May 1995, he, at first, even hesitated to disseminate it in Germany but later discovered it was really longed for. That the speech by Stalin circulated by the author in Germany after some delay caused an authentic sensation was a surprise insofar as it shows how deficient people's knowledge of Stlain must be in Germany, even among interested groups of persons. Kopelew, "Freie Dichter und Denker."